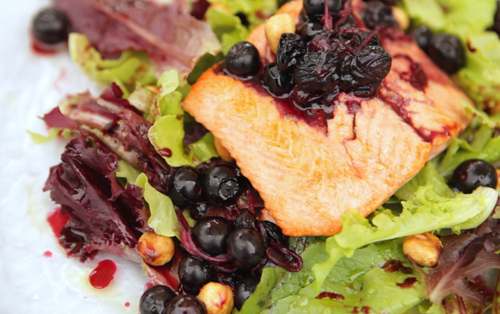 Roasted Wild Salmon BC Blueberry ‘Pickle’ Local Honey & Hazelnuts, SOLE Food Farms Greens From Four Seasons Hotel Vancouver Executive Chef Ned Bell This amazing dish serves up the best of local BC summer produce with fresh sockeye salmon, BC blueberries, local honey, hazelnuts and even the Venturi-Schulze balsamic vinegar is a BC local product! Try it with your favourite fish and favourite fruit, this versatile recipe is about cooking with what is fresh and what you like. Sea salt for 5 minutes over medium heat. Remove from the heat and add remaining 1 cup Blueberries. Let cool. Garnish with 2-3 tbsp of the BC Blueberry ‘Pickle’.